Returning fire with my unregistered assault keyboard. The militant atheists that hole up with the hands at the Darwin Ranch (down yonder at Deception Pass) don't quite live up to the "reason" that they claim to support. Logical fallacies abound, and some of their favorites are the ever-present ad hominem, the frequent circular reasoning, the pernicious red herring (such as "the Ark Encounter money could have been used to feed the poor"), and the ubiquitous straw man argument such as this foolishness from L. Aron "AronRa" Nelson. (Ironically, the guy next to him in this picture advocates the teaching of critical thinking, which creationists have done for years, since critical thinking refutes both atheism and evolution). We'll focus on the straw man, but don't let the horses eat him, the straw is moldy. Anti-creationists sometimes claim that our best argument against evolution is, "It's just a theory". I'll allow that some underinformed creationists have used that remark, but organizations advise that it is to be avoided by creationists. It's far better to say that evolution has not been proved. There's another problem, however, and that's the use of the word theory. Scientists use the word different from us reg'lar folk, they mean that a theory is an explanation of data is well-substantiated. (How many times do you hear someone say, or even do it yourself, "I have a theory about that..."? Not a whole passel of scientific investigation happening on the street.) Evolution does not qualify as a theory, but is at best a conjecture or hypothesis. A short and unimportant post caught my attention. It was written by someone using the moniker "Logic vs Gods", and the post is useful to those of us who like to study logic. 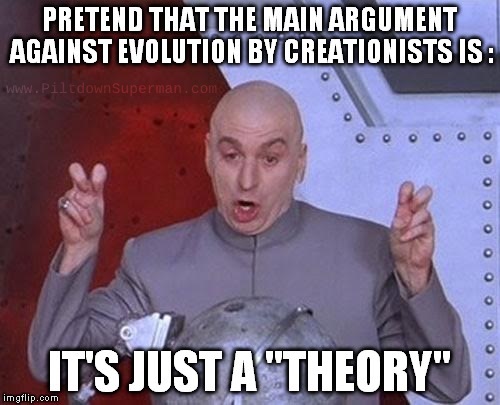 It is called "Creationists’ invalid excuse for rejecting evolution: ‘It’s just a theory’". He asserted using logic, then proceeded to fire off a volley of fallacies. The biggest problem is that he tried to dry gulch creationists by accusing us of relying on straw man fallacies while building his main premise on one of them his own self. I'll give you a few examples, but to see his embedded links, you'll need to visit the article itself. It’s very easy to understand the reason monotheistic religions reject the theory of evolution. If evolution is accurate, the religions are inaccurate. . . And if evolution is accurate, our worst fears are realized — we are indeed mere mortals. The straw man begins with a hasty generalization ("monotheistic religions") and cherry picking. "And if evolution is accurate, our worst fears are realized — we are indeed mere mortals." Does the author know that atheists are way ahead of him on this? That subject should have been left out since it's not developed. The remark, "...they would lose and have lost historically" included a link to the ridiculous Dover case, which he uses to generalize against all creationists. Yet, creationary scientists have a difficult time getting evolutionary scientists to debate! He asserts, "...there is a lot of evidence supporting evolution and less than none supporting Noah’s ark/flood". Creation science ministries have tens of thousands of articles on science refuting evolution, science about the global Genesis Flood, the veracity of Noah's Ark, and theology. The claim is fallacious because he makes an unsustainable assertion (but links to a couple of sites in the original to supposedly back up his points, but he clearly did not do his homework). "In my experience"? Well, his alleged experience should not be used to generalize a "fact" about creationists. "...they almost always revert to what they believe to be their best argument — evolution is ‘just a theory.’" Well, if my years of experience and been doing intensive creation science for quite a spell count for anything, I've seen few professing creationists use "it's just a theory" as an argument. Has this writer ever encountered any knowledgeable creationists, or investigated any biblical creationist sites? Absolutely not! And I can prove it easily in one belief — miracles. Here we are in a universe acting perfectly in accordance with the laws of physics. We have no documented example ever in reproducible experiment of these laws being thwarted. But at will and on thousands of occasions, according to the holy texts, God has thwarted these laws of physics (and continues to do so every day). Every miracle, by definition, is a refutation of the laws of physics. Oh, please! 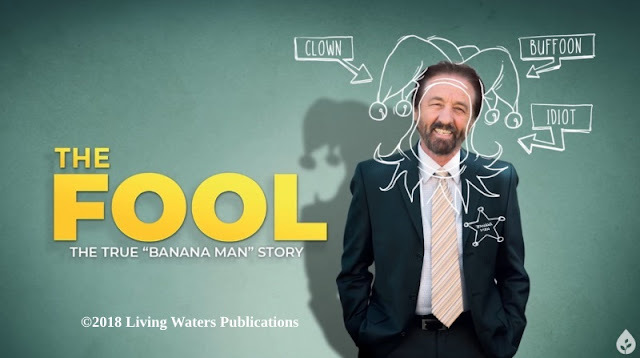 He appeals to motives, makes another straw man (miracles, similar to another anti-creationist claim that we rely on "GodDidIt"), begs the question, and also commits the category mistake of subjecting the supernatural to materialistic methods. "Every miracle, by definition, is a refutation of the laws of physics." Another unsubstantiated assertion, and a gross disunderstanding of the way God operates. By the way, the fact that the universe follows certain laws is an argument for the existence of the Creator. So if evolutionary theory did grow up to be a law — which of course it won’t by definition, that would that convince any creationist of it’s validity? No, again it’s just a straw man argument meant to denigrate the mountains of evidence science has discovered about the world. There he goes again, making a straw man to protest the use of the straw man fallacy (I think this is the author getting a delivery). Plus, a question-begging epithet that creationists won't be convinced if evolution became a law. So what good is his hypothetical remark, other than to used biased language to sway his readers? Then he adds argumentum ad verecundiam (appeal to authority) and implies the ad populum (appeal to popularity) fallacy with another bland assertion about "mountains of evidence". Let's take a gander at something similar. Unfortunately, there are some professing Christians that elevate current trends in science philosophies above the Word of God. Theistic evolutionists proclaim the glories of Darwinism and put God's name with evolution as if it was a sanctifying bumper sticker. (I believe that TEs are actually Deists because of their disdain for the word of God and the way they treat Bible-believing Christians.) Recently, a TE visited The Question Evolution Project on Facebook and attacked a post about the Ark Encounter. Ironically, it linked to an article I wrote about Ark Encounter and Darwin's Deceivers. For more about Theistic Evolution, see my article beginning with "Waterless Clouds, Wandering Stars". He used the name "True Creation", and the diatribe was so biased and fallacy-riddled, I didn't see fit to spend my time on it. (Here's a screenshot for those who want to play "Spot the Fallacy". Click to make it larger.) However, I want to address a couple of things. First, it was specifically an attack on Ken Ham. (Ken and I are not best buddies even though he inspired me years ago, and I suspicion that he or a staff member took a dislike to me for some reason, but never mind about that now. I still support his work, along with that of several other biblical creation science ministries.) Like Bill Nye, the writer acted like Ken Ham is the only one promoting biblical creation, the Genesis Flood, and the reality of Noah's Ark. He also used a straw man argument (as well as prejudicial conjecture) about the number of species in the world today, the number of species on the Ark, and erroneously concluded that evolution is the only answer. In addition, he brought up another falsehood, that "...they want this rubbish taught as a science in science class". Since he specifically maligns Answers In Genesis, I suggest that he round these AiG articles up for his corral: "Should Creation Be Taught in Public Schools? ", and about species, a series entitled, "The Origin of Species After the Flood". For some heavy science, "On the Origin of Eukaryotic Species’ Genotypic and Phenotypic Diversity". At least he didn't use the "creationists argue that it's just a theory" stuff. People have a great deal of faith in evolution, and hate creationists. But it would be helpful if they actually bothered to tell the truth about us, and to learn some critical thinking skills. We have both the truth of Scripture and the facts of science on our side.